Overdose was, is and apparently will be one of the leading causes of premature death in the region of CEECA. Despite the scarcity of regional statistics that don’t allow us to carry out a proper analysis of the causes of death, we can state that overdose among other causes like HIV and viral hepatitis continues to take thousands of lives of people who use drugs in our region. We started systematic advocacy of naloxone more than ten years ago in CEECA. Experts and activists from all over the world, together with the International Harm Reduction Network and the Harm Reduction Coalition (USA), we all pushed forward to make internationally acknowledged that overdose is a problem that cannot be solved without the involvement of the community. In practice, it means that people who use opioid drugs and their families must constantly carry naloxone with them because they can help much earlier than the police or an ambulance arrive and they can save other person’s life. Since then, the Resolution on Overdoses of the Commission on Narcotic Drugs and WHO recommendations were adopted but in most countries of the region access to naloxone is extremely low or non-existent. 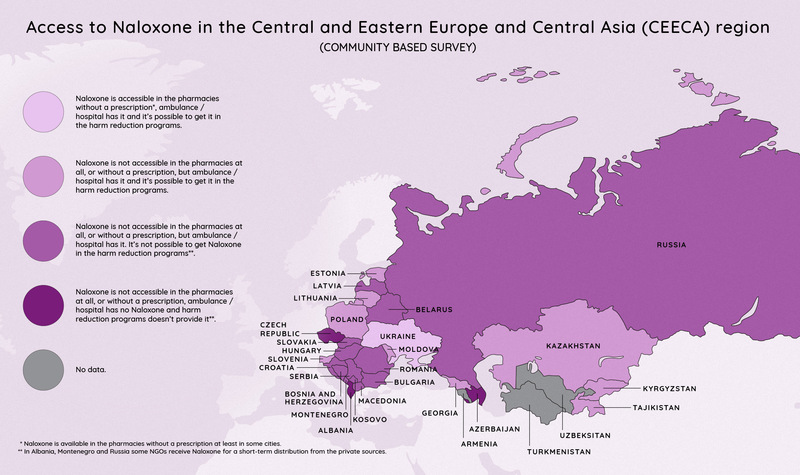 A survey of EHRA members that we conducted on the eve of Overdose Awareness Day shows that it is impossible to buy naloxone without a prescription practically in any country of the region. Countries which allow people who use drugs to receive free naloxone in harm reduction programs are still the exception. The survey also shows that people coming out of prison – they are at the highest risk of death from overdose – do not receive naloxone upon release in any of our countries. The experience of countries in which there has been a reduction in mortality from overdose shows that it is necessary to adopt the following set of measures: decriminalization, access to substitution treatment, drug quality tests, safe injection rooms. However, preventing overdose without allowing free access to naloxone is the same as trying to reduce HIV rates without ARV. The main difficulty of advocating for free access to naloxone is that it is an injectable drug, so it can only be sold by prescription. In fact, there are non-injectable forms of naloxone (for example, in the form of a nasal spray) that have been sold worldwide for several years, and no prescription is required for this type of naloxone. However, these types of naloxone are not registered in most countries of our region. Their cost is often much higher than the cost of a normal, injectable naloxone. We will have to go a long way to provide access to inter-nasal naloxone – engage in negotiations with the state and pharmaceutical companies on public procurement, price reduction, possibly even the production of generics, the inclusion of non-injectable forms of naloxone in the list of vital medicines …We already have experience of such work on advocating access to HIV and hepatitis treatment – perhaps it is time for us to try to apply it to solve the problem of overdose?